Glasgow is famous for many things – some good, some bad. In its industrial heyday it was the ‘second city of the Empire’, its ruling classes rich on the profits of international trade. It its mid-century decline it gained a rather less savoury reputation as a city riddled with unemployment, drug addiction and horrifyingly low life expectancies. This is not unrelated to the fact that it’s known the home of such delectable treats as the deep-fried Mars bar and deep-fried pizza – though I have to say, I think the first one is an urban myth. I’ve only ever seen one for sale in Edinburgh. If you’re a friend of mine, then you probably know Glasgow best as ‘that place that Claire’s always wittering on about’, because, while I wasn’t born there, it’s the closest thing to home that I have, and I love it above any other city in the world. We’d be here all night if I were to explain all the reasons why, but when I returned last weekend I was keen to indulge in one of them – Glasgow’s ice cream parlours. All across the city, you’ll find these little treasures. They’re just the place for a cuppa and a sweet treat while you catch up with friends, or a huge sundae with all the trimmings to celebrate your birthday. You’ll notice, too, that most of them have Italian names – Jaconelli, Crolla, Boni – and there’s a definite Italian flair to them. So what’s the story behind all these Scottish-Italian ice-cream palaces? A large Italian community settled in Glasgow (and indeed, across Scotland) from the mid-19th century onwards. Looking for ways to establish themselves, many turned to what Italians perhaps do best – food – and set up cafés where they served ice cream, along with drinks and food influenced by their new home. 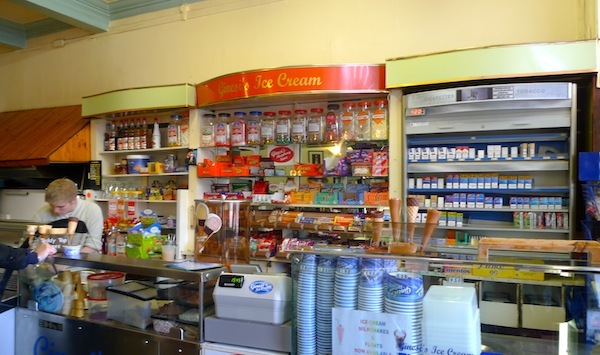 Decades on from their foundation, many of these ice cream parlours survive, and are now a through blend of Scottish and Italian. Those that survive with their original features intact are outstanding and hugely valuable examples of mid-century design – an eclectic, more-is-more take on Art Déco and Moderne, with mirrored walls, stained glass windows, red banquettes, fish tanks, juke boxes and giant fibreglass ice cream cones flanking the doors. Because they serve their communities, these cafés are classic British greasy spoons, serving beans on toast, mugs of sweet milky tea, chips and mushy peas, and fried breakfasts – but they also serve amazing ice creams. This isn’t modern-day Italian gelato, soft and swirled and intensely flavoured. It isn’t the predominant American-style premium ice cream, dense and rich and packed full of add-ons – bits of other desserts, huge swirls of sauce. It’s a peculiarly Scottish-Italian ice cream that I suspect is closer to what Italians ate 90 years ago, and which has incorporated classic British elements too: viciously pink sauce, and new flavours based on Red Bull and Irn Bru that sit alongside the traditional pistachio, biscotti, chocolate and vanilla. In fact, order vanilla and you might be a bit surprised. It won’t taste very much of vanilla. Some ice cream parlours just call it ‘white’ flavour, and that’s more accurate: this is, in fact, the classic Italian flavour fior di latte, transcribed to chilly Scotland. Two of my dearest friends have just moved to Glasgow’s South Side and live three minutes’ walk from Queens Café, one such ice cream parlour. 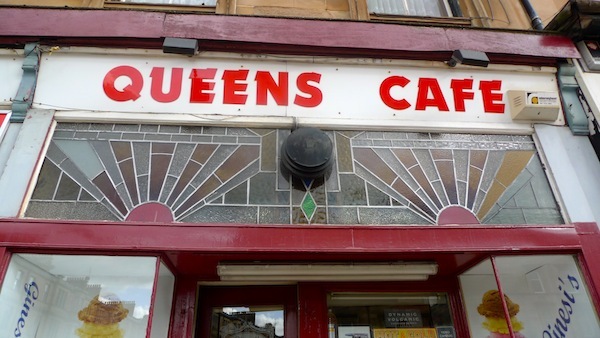 Its interior is nothing to write home (or indeed a blog post) about, especially compared to the glories of Café d’Jaconelli, the University Café, or Nardini’s, down the coast in Largs. But the ice cream is just as good and is proudly served by generations of the same family. 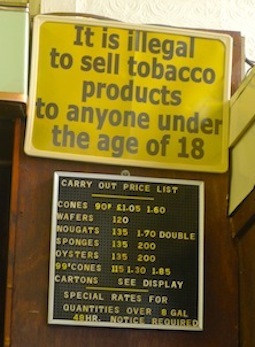 Ice cream and fags, side by side. 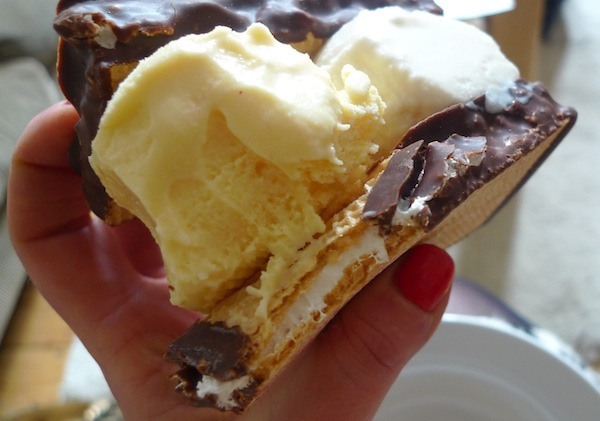 This is my ‘double nouget’ – two scoops (biscotti and vanilla) sandwiched between marshmallow-filled, chocolate-dipped wafers. Genius, and a snip at £1.70. 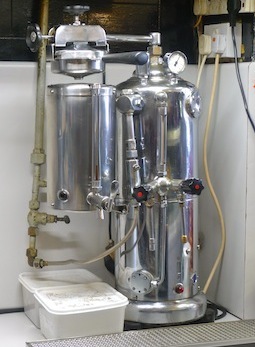 There were once hundreds of café like these, but they’re disappearing fast – all the more reason to treasure those that remain, both for the way they look, the ice cream they make and the fact that they’re family-run businesses and real life-lines for some members of the community who have been regulars for literally decades. My talented friend, the illustrator Rosie Ferrier, completed a series of studies of Glasgow’s ice cream parlours in collaboration with Louise Lockhart. She’s kindly given me permission to republish some of them here, but you can see more on her blog. 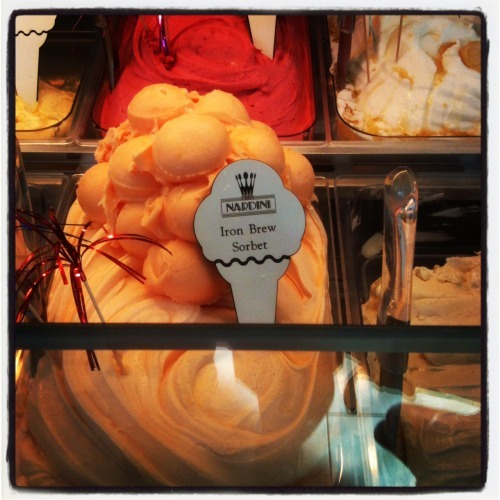 I visited the mighty ice cream palace Nadini’s (which has also recently opened a new outlet in Glasgow, on Byres Road) during a trip last summer when I explored the UK by taking as many trains as possible in one week. You can read more about it – and what else we got up to – here. And for an in-depth account of the history of Italian immigrants in Scotland and their ice-cream empires, this site is invaluable. Yum! And that’s just the illustrations! 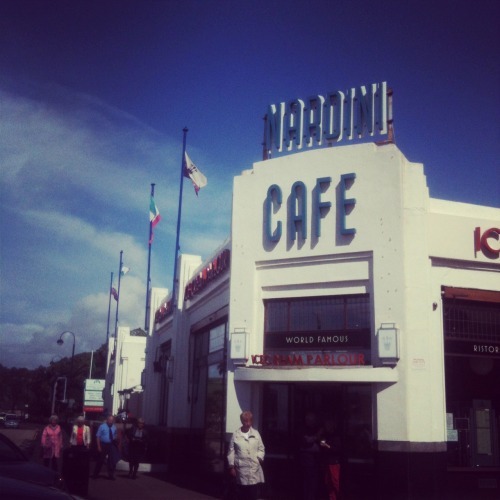 I love Nardini’s! And I’ll have to check out some of those Glasgow ice cream parlours next time I’m in town – thanks to your post I’ll know where to find them! 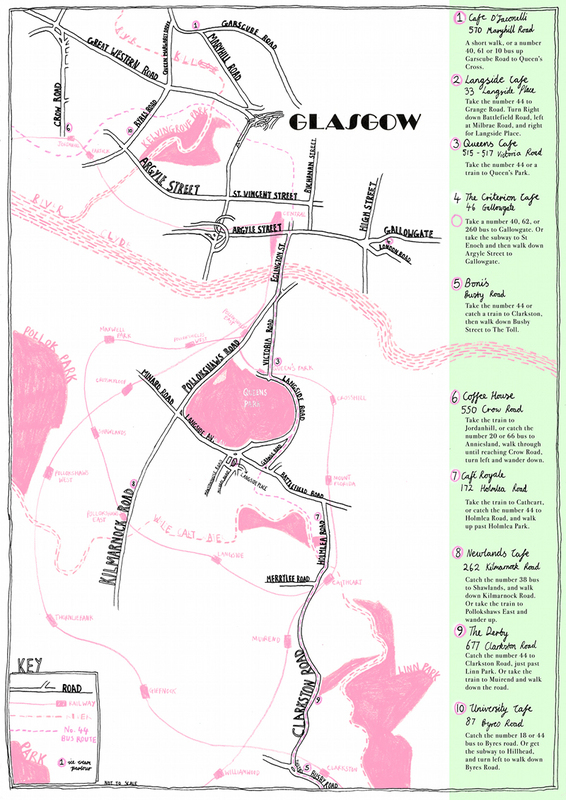 Great post and I love the illustrations – especially the ice cream parlour guidemap! As a Glaswegian I’m ashamed to say I haven’t had the pleasure of eating at some of the places you mentioned but this map will prove very handy in resolving that! 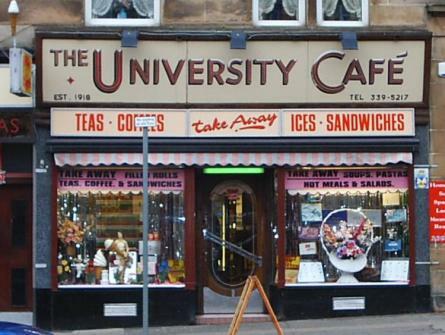 I’m a big fan of the Uni Cafe but I think The Derby just about pips it to the post. I haven’t been to them all, either… need to go on a tour armed with that map.